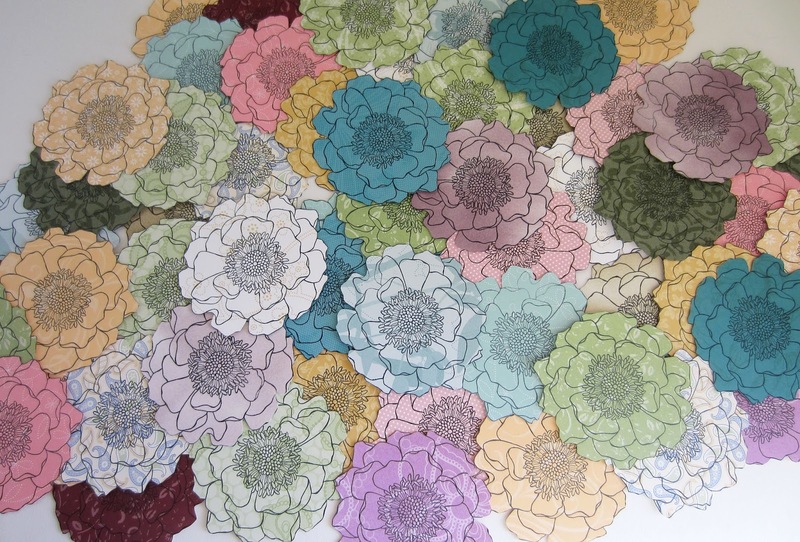 Do you remember a few weeks ago, while on a torturous long car ride, I kept myself busy and awake by cutting many many Blended Blooms stamped on Designer Series Paper prints? As a reminder, check out that all-important post here: The Most Effective Way to Conquer Car Riding Stress. After cutting out this multitude of pretties, the next step was to stamp on coordinating DSP the centers.. Then, to cut all THEM out. I realize that I did not post any photos of that task in progress. 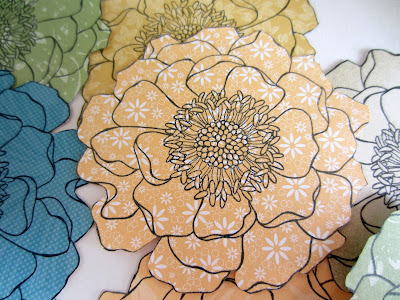 But, just realize that cutting out those centers was much more time-consuming and eye-fatiguing than cutting the blossoms themselves. A couple of the flowers I actually cut in layers and stacked them for more dimension. The effect wasn't stunning enough to continue to do that, so I simply plan on using the majority of them as a single layer with a center added. 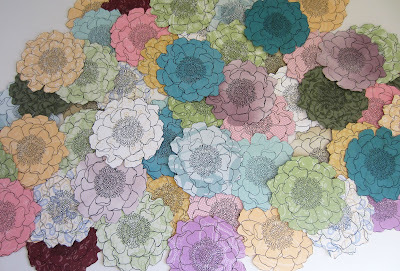 Anyway, I have not yet fitted all the flowers with their centers, but I did complete a few. 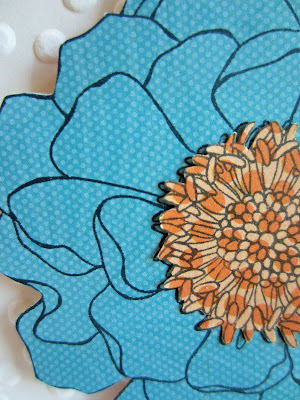 Now, after all the difficult detail work has been done, comes the fun part: Using all these flowers in various projects. Does this type of project -- where you do all the tedious detailed work ahead of time -- appeal to you? For me, as I've already said, it is a perfect task to do during long, boring periods of otherwise wasted, unproductive time. 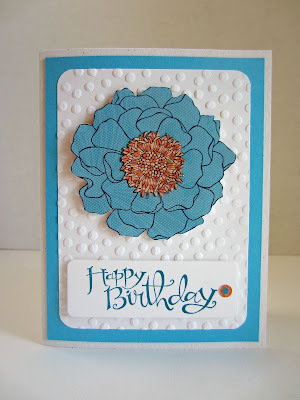 Then, it is wonderful to have an assortment of finished beauties to make quick work of a card when an occasion arises. Your card is beautiful. I still have to find my stamp and then stamp and cut!! I love this post, the cut outs are so unique, nothing like it out there! Thanks for sharing this on Dream Create and Inspire. What a beautiful card. Thank you so much for linking up on #HomeMatters Party this week. Hope you will come back and share again. These are so pretty! The possibilities are endless with these flowers! What a beautiful cards. I would love to get one. So Pretty!! Thanks for Sharing on My 2 Favorite Things on Thursday!! Hope to see you again this week!! I Pin everything to My 2 Favorite Things Pinterest Board!